The Weimar National Assembly (German: Weimarer Nationalversammlung) was the constitutional convention and de facto parliament of Germany from 6 February 1919 to 6 June 1920. The assembly drew up the new constitution which was in force from 1919 to 1933, technically remaining in effect even until the end of Nazi rule in 1945. 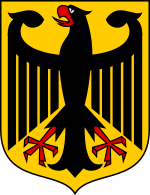 It convened in Weimar, Thuringia and is the reason for this period in German history becoming known as the Weimar Republic. With the end of the First World War and the start of the November Revolution, Chancellor Max of Baden announced the abdication of the German Emperor Wilhelm II on 9 November 1918. He also appointed Friedrich Ebert as his own successor as Chancellor. The Council of the People's Deputies, a provisional government consisting of three delegates from the Social Democratic Party (SPD) and three from the Independent Social Democratic Party (USPD), took over the executive power on the following day and called for a National Congress of Councils on 16 to 21 December to convene in Berlin. This Reichsrätekongress set elections for a national assembly to take place on 19 January 1919. The Bavarian Peasants' League (BB), German-Hanoverian Party (DHP), Schleswig-Holsteinische Bauern- und Landarbeiterdemokratie (SHBLD), and Brunswick Election-Union (BLWV) each attained less than one percent of the vote. The Communist Party, founded in December 1918, boycotted the elections. Although SPD and USPD had been instrumental in introducing women's suffrage, most women voted for the DDP and DNVP (in Protestant parts of the country) or the Zentrum or BVP (in Catholic parts). :17 The parties were attributed a number of seats proportional to the number of votes they received. Out of a total of 416 delegates just 37 were women. :17 The so-called "Weimar Coalition" of SPD, Centre Party and DDP held an absolute majority of the seats. 12 May 1919 – the National Assembly met for a protest rally against the Treaty of Versailles, Scheidemann called it "inacceptable"
11 August 1919 – Reichspräsident Ebert signed the constitution. It came into force on 14 August 1919. Final meeting of the assembly in Weimar. 20 May 1920 – supported by the SPD the majority of the assembly called on the government to end the state of emergency in all of Germany. The government refused. On 21 May 1920 the National Assembly dissolved itself. After the first elections based on the new constitution took place on 6 June 1920, the Reichstag took over the role of the National Assembly. Wikimedia Commons has media related to Weimar National Assembly. ^ a b c "Chronologie 1919 (German)". Deutsches Historisches Museum. Retrieved 23 July 2013. ^ a b c d Sturm, Reinhard (2011). "Weimarer Republik, Informationen zur politischen Bildung, Nr. 261 (German)". Bonn: Bundeszentrale für politische Bildung. ISSN 0046-9408. Retrieved 17 June 2013. ^ a b "Chronologie 1920 (German)". Deutsches Historisches Museum. Retrieved 23 July 2013. ^ "Friedrich Ebert (1871–1925). Vom Arbeiterführer zum Reichspräsidenten (German)". Friedrich Ebert Stiftung. Retrieved 23 July 2013. ^ "Files of the Reichskanzlei: Kabinett Scheidemann, Einleitung II (German)". Bundesarchiv. Retrieved 23 July 2013. This page was last edited on 23 February 2019, at 18:47 (UTC).